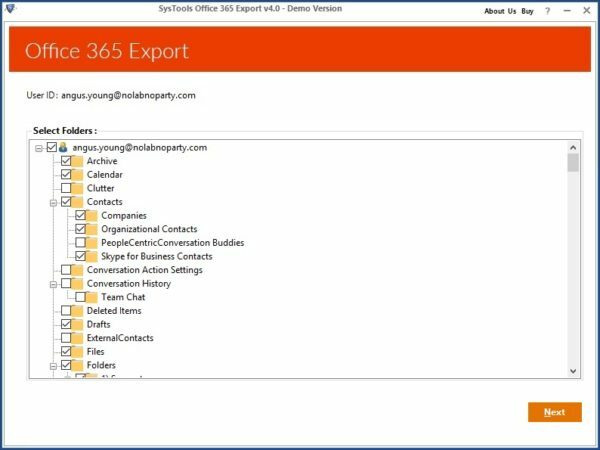 To export items from the Office 365 environment, SysTools provides the Office 365 Export solution to extract data from Office 365 to PST, EML, or MSG file formats. 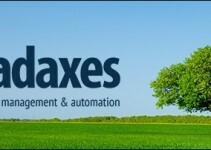 The software solution is extremely easy to use and the installation is quick and requires just few clicks. 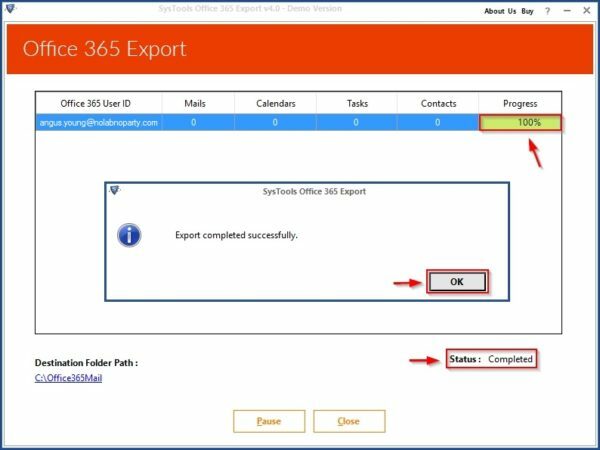 Export Office 365 items - the tool allows to extract Office 365 items, such as email, contacts, tasks, calendar, etc., and save them to the local machine in PST (Microsoft Outlook is required to export data into PST), EML and MSG formats. A report is generated when the export process has completed providing the status and info of the extraction. 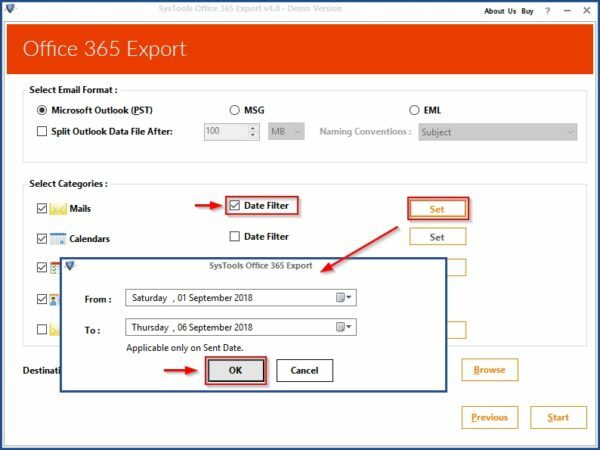 Export Office 365 data within specific dates - instead of exporting the entire mailbox, items to export can be filtered by specifing a range of dates. Extract Only specific data - the user can specify items to export saving space and time simply by selecting the desired item checkboxs. Stop and resume export process - the export process can be stopped and resumed as many times as needed in case the Internet bandwidth is limited and need to be used for other tasks. The application can be installed in Windows 10 or below versions and requires the .NET Framework 3.5 installed. During the installation process, missing components will be installed automatically. 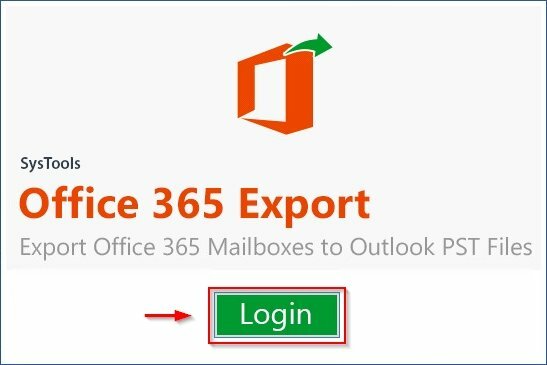 To export Office 365 data into PST, MS Outlook 2016/2013/2010/2007 also needs to be installed in the compouter. Office 365 admin account must be impersonated for Admin Account Migration. 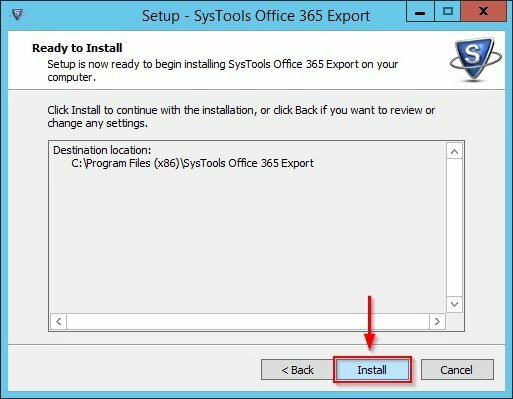 Download latest SysTools Office 365 Export version and run the installer. Click Next to continue. Leave default location and click Next to continue. Leave default value and click Next. Leave default options and click Next. Click Install to proceed with software installation. The tool is being installed in the computer. The installation process checks if required components are installed in the system. 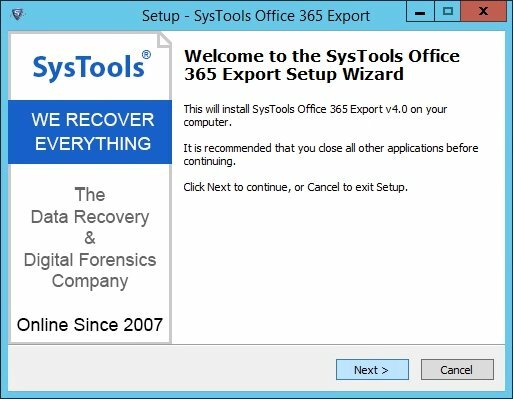 If missing, the procedure runs the Microsoft Online Services Sign-in Assistant installation wizard first. 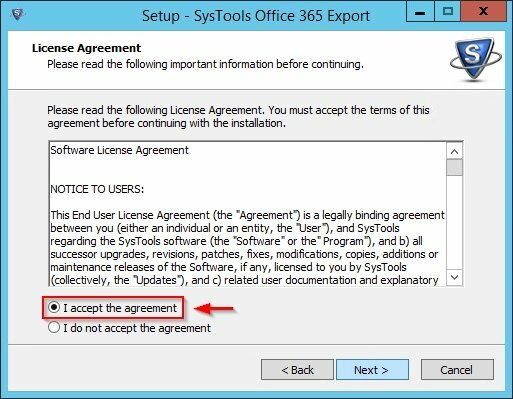 Accept the EULA and click Install to proceed. 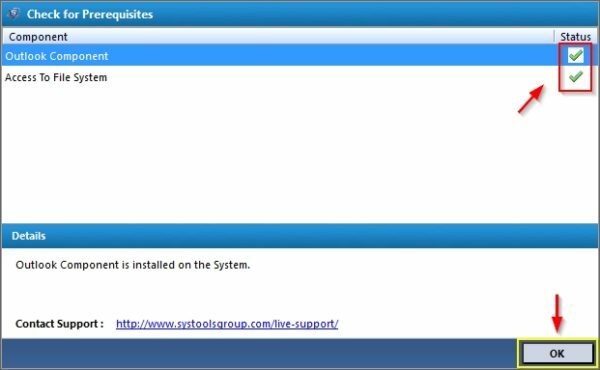 The installation is pretty straightforward and requires only few clicks. 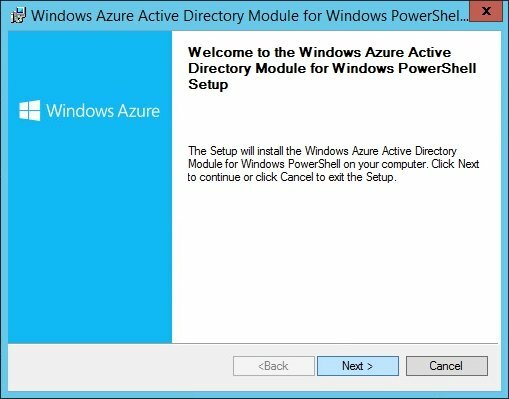 Same procedure for the Windows Azure AD Module for PowerShell. Click Next and follow the instructions. 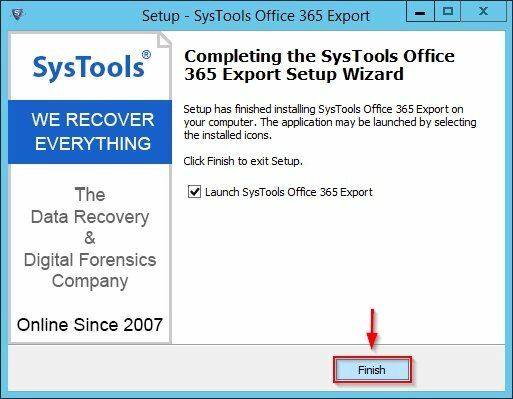 When the missing components installation has been completed, click Finish to exit the wizard and launch the application. 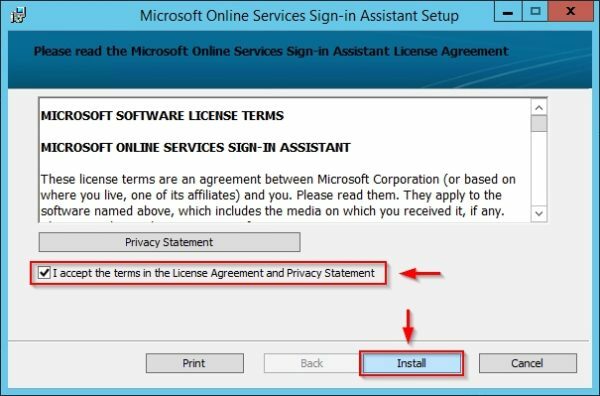 If you run the software with no license, you have the option to start the tool in demo version or to Activate the license. In the example the demo version is launched with the button Continue Demo. The application checks for prerequisites. If the status is marked with green checks, all prerequisites are met. Click OK. Enter the account name and password. 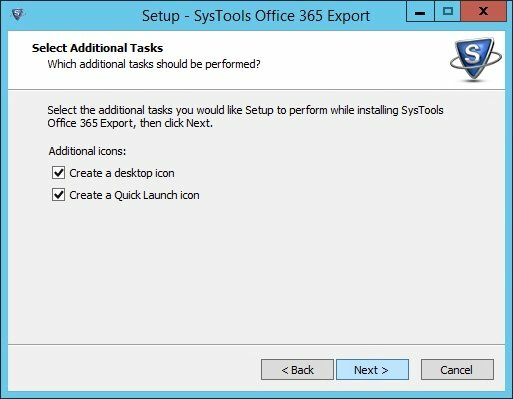 Enable the Is Admin checkbox if the account has the permissions to access the organization mailboxes then click Sign In button. 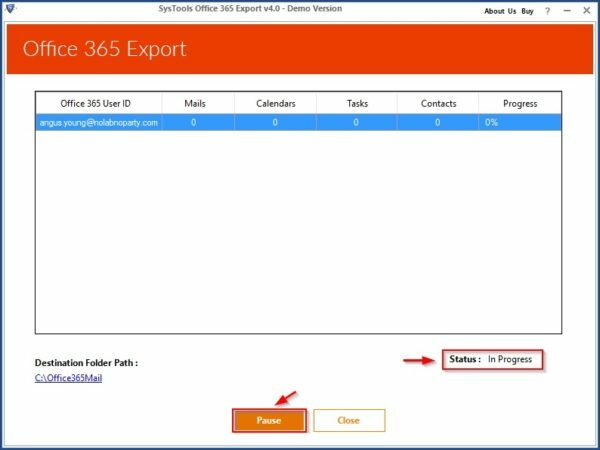 The specified user must have a supported Office 365 license assigned and granted with the impersonation permissions. The mailboxes configured in the specified tenant are displayed. Select the users to process and click Next. 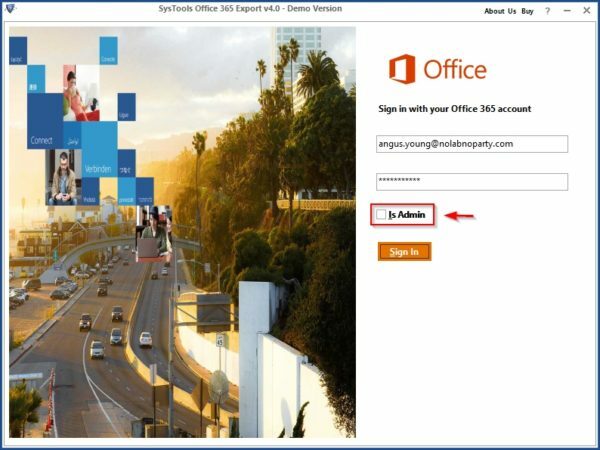 If the option Is Admin is not enabled, only the mailbox of the entered user will be displayed. For the logged in user, select folders to export and click Next. 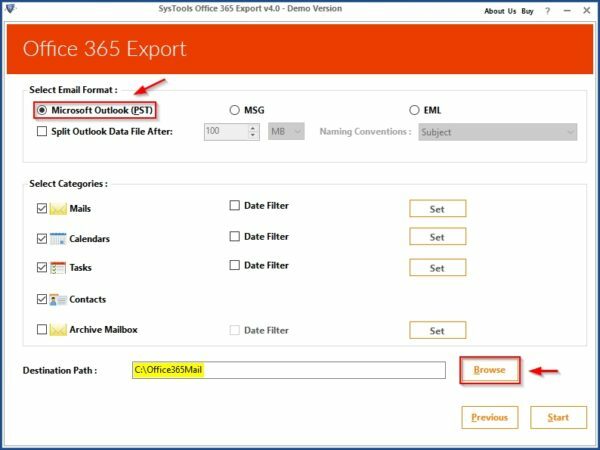 Specify the Email Format (PST in the example) to use with the option to Split Outlook Data File After specifying a value. Select the items to export from the Select Categories area and click Browse to specify a Destination Path to store exported data. 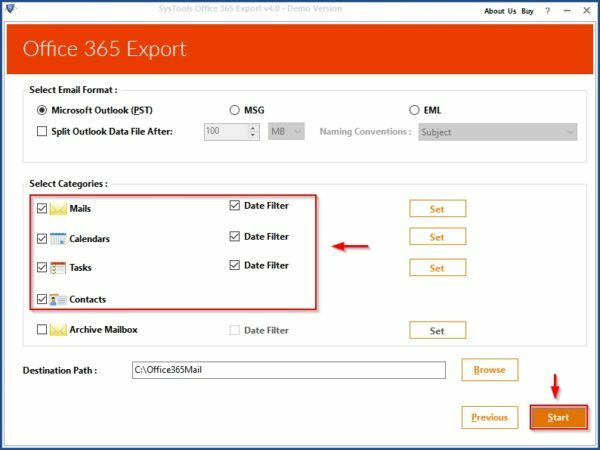 If you want to export data only from a specific range of dates, enable the appropriate Date Filter option for the item to process and click Set. 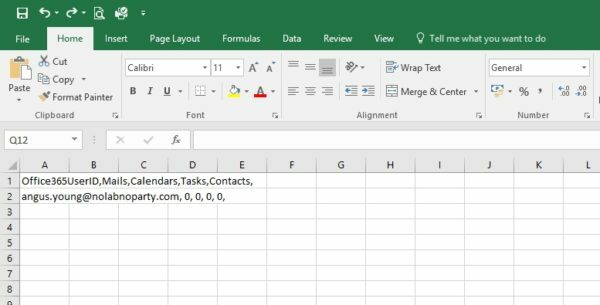 Specify From/To date range and click OK. 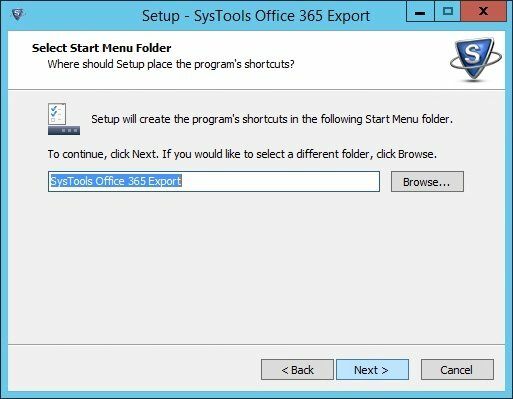 When the export dates have been configured, click Start to proceed with the export procedure. 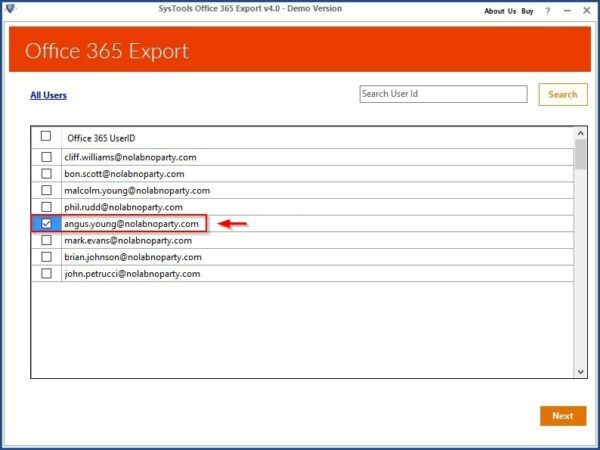 You can also export Archive Mailbox but the processed user must have In-Place Archive Mailbox enabled. 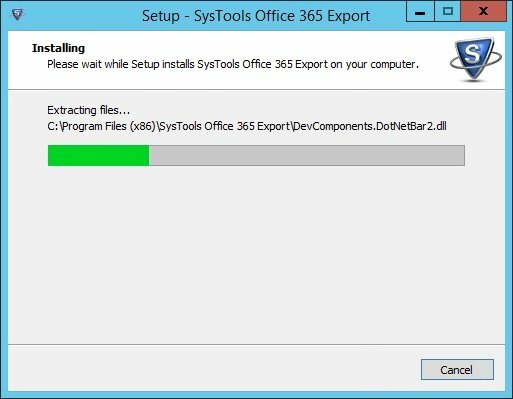 The export process begins and the Status is reported as In Progress. Clicking the Pause button, you can pause the process and resume it as needed. When the export procedure has completed, a message is displayed. In the Progress column is indicated 100% and the Status as Completed. 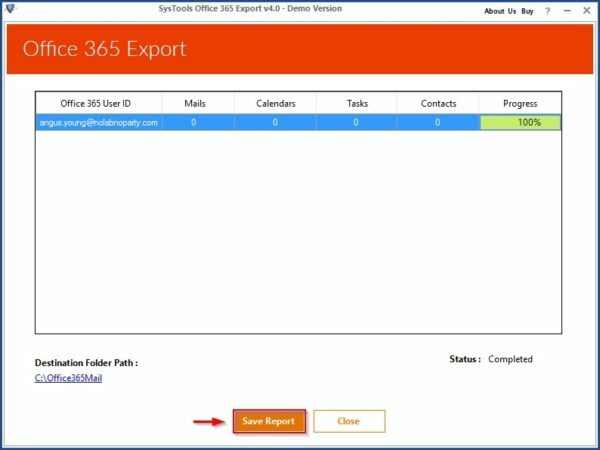 Click OK.
Click the Save Report to generate a report in CSV format containing exported info. The content of the generated report. User's export report and the exported data file (PST for example) are located in the folder previously specified. 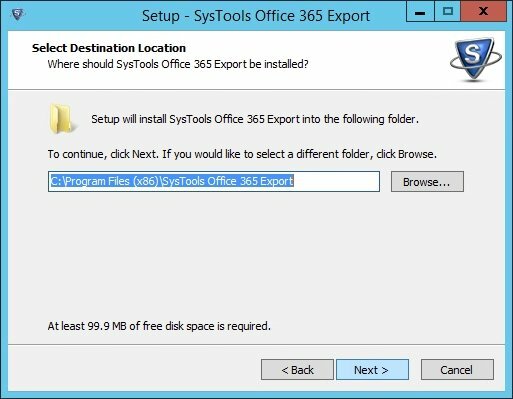 SysTools Office 365 Export is available to download as a free trial.